Himalaya is abode to various plants with medicinal use. Rhododendron arboreum tree from the valley of Himalayas known for its bright scarlet red bell shaped flowers filled with sweet nectar, is one such tree with medicinal uses. Flowers and leaves of this tree have been long for medicinal purposes. 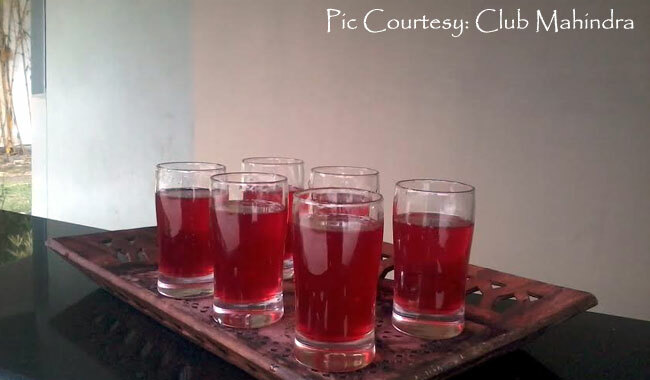 Commonly known as Burans, juice made from its flowers is very popular beverage in the region. The tree is found in Himalayan hills ranging in India, Bhutan and Nepal. It has also flourished in Nilgiri hills of South India. It is also found in mountains of Sri Lanka, Thailand and Myanmar. A national flower of Nepal, Rhododendron arboreum is also the state tree of hilly states of Uttarakhand & Himachal Pradesh in India. Rhododendron arboretum is generally a small tree but can grow high upto 20 meters. A 20 meter Rhododendron arboreum tree has been spotted on Mt. Japfu in Nagaland, India. Crowded towards the ends of branches, leaves of burans are bright green with distinct veins and covered with light brown felt under the surface. The tree generally blooms in January to March and flowers are clustered making the entire tree appears bright red. The name ‘Rhododendron’ is derived from Greek word – Rhod or rose like and Dendron which means tree. Since this specie is more like a tree, it has species name ‘arboreum’ refers to ‘tree-like’. It is also known by other names like Burans बुरांस, buransh बुरांश (Garwhali), Buras, Barah, Rohitaka (Hindi), பிலி Billi (Tamil), Kattupoo varasu (Malayalam), Pu (Kannada), लाली गुराँस Lali gurans (Nepali), Eras (Kumaoni), Adrawal (Punjabi), Maharathmal, Aselamal, Big-Ixora (Sinhalese). Drink made from burans flower is simply divine, as the locals term. Bright red similar to rose or strawberry drink with jelly like texture, Burans flower juice taste is tangy and sweet. Just like Indian Gooseberry, water tastes sweet after munching burans flower. Treating guests with burans flower juice is a traditional practice in Uttarakhand, India. It is believed to refreshing, appetizer and relieves mountain sickness. When the flowers bloom after winter, locals consume burans along with rice or in form of chutney to treat seasonal sickness. Burans parathas and burans pakodas are also popular. Nectar of this flower is used to brew local wine. Flowers are typically stored in form of juice, jelly or squash. These flowers are considered spiritual and used in religious functions and decoration purposes. Wood from the tree is used to various purposes including fuel wood, packaging and making artifacts. Smoke by burning burans tree wood is considered purifying in Eastern Himalayan state of Arunachal Pradesh, India. Leaves are used to get rid of insects and lice. Burans flower offers mainly fibers and is good source of Potassium, Calcium, Iron and Vitamin C. Bright red color of this flower is due to presence of vitamin like flavonoid Quercetin. Studies show that the flower offers good amount of phtyochemicals of medicinal value including phenols, saponins, xanthoproteins, tannins, flavonoid and coumarins. Three biologically active compounds – quercetin, rutin and coumaric acid have been found in this flower. Interestingly these are the three compounds found in apple and responsible for its health benefits. While the leaves have similar phytochemcials content, they posses other compounds which are potentially toxic in nature. Burans leaves have been used as traditional medicine to cure some diseases. Various Ayurvedic and homeopathic medicines have used burans flowers and leaves for treating body inflammation and treat gout, rheumatism, bronchitis and arthritis. Lab studies with Rhododendron arboreum showed significant anti-inflammatory properties. Animal studies showed ability of burans flower extract to cure paw edema in rats. Flavonoid, tannin, saponins and other phytochemcials are believed to be responsible for such effect. Two such chemical with strong anti-inflammatory property – Quercetin and Rutin are found in burans flower. Quercetin is known to relieve inflammation of prostate, kidney and urinary bladder. Rutin is helpful in treating painful ulcers in mouth and gastrointestinal tract and ued for osteoarthritis. Young leaves of Rhododendron arboreum have been traditionally used in treating headache. Paste made from tree leaves is applied to forehead to relieve head ache. Leaves of burans tree are astringent and used as poultice in treating wounds and reducing skin inflammation. Burans flower juice is helpful in relieving stomach ache. Animal studies with extract of burans flower and leaves have showed potential to reduce stimulus of pain in rats. Various phytochemcials have been isolated from Burans leaves and flower which have high antioxidant properties. They exhibit beneficial property in getting rid of harmful free radicals in body. Burans flower juice is thus a great antioxidant drink for your heart, liver, kidney and skins. Lab studies confirm antioxidant properties of Burans flower and leaf extract and suggest its utilization in therapeutics. Local people from Nepal have been using burans flower for treating diabetes. Latest studies have confirmed anti-diabetic potential of burans flower and suggested its uses as functional food in treating type I and type II diabetes. Methanol extract of burans flower have showed in-vitro anti-diabetic activity suggesting its potential in development of new medicines for diabetes. Animal studies with burans flower extract showed reduced blood sugar and cholesterol levels in rats. This property can be attributed to presence of compound hyperin with antioxidant property and ability to inhibit action of certain glucose enzymes. Traditionally flowers and leaves of burans tree have been used as home remedy over diarrhea and dysentery. Dried petals powder and paste of dried leaves powder are found helpful in relieving diarrhea. Lab studies with ethyl acetate extract of burans flowers showed potential antidiarrheal activity. Similarly animal studies showed effectiveness of burans flower extract in treating castor oil and magnesium sulfate induced diarrhea in rats. Burans flower extract showed ability to reduce frequency of stools in rats. Phytochemicals mainly flavonoids, tannins, sterols and reducing sugars were considered responsible for such ability to treat diarrhea. Flowers and leaves of Rhododendron arboreum contain wide range of phtytochemical many of them have independently reported antimicrobial properties. These include various bioactive steroids, saponins and flavonoids. Lab studies with alcoholic extract of burans flower have confirmed its effectiveness over wide strains of bacteria in various concentrations. Quercetin and p-coumaric acid are two such flavonoids present in burans flower with established antimicrobial action. P-courmaric acid is believed to exhibit antibacterial action and help modify gut flora. You would find locals saying how burans flower juice is good for heart. It helps in lowering blood pressure and bad cholesterol. Various phytochemicals in burans flower juice offer antioxidant property and protect heart from oxidative stress and reduces risk of stroke and other heart disorders. Quercetin and rutin are two flavonoid found in burans flower juice which have established its benefits for heart. Quercetin supplementation is prescribed in treating hypertension, atherosclerosis and other heart disorders, while rutin helps in preventing blood clots which pose risk of heart attacks. Drinking burans flower juice is therefore good for heart and circulatory system. Local people consume burans flower when it blooms and is believed to protect them from illness onset a change of weather including allergies, asthma, hives or hayfever. Quercetin in Burans flower juice helps preventing allergic response of immune cells in body. Burans flower have been used in Ayurvedic medicinal forms to reduce cholesterol and as liver tonic. Animal studies with rats showed that alcoholic extract of burans flower and leaves was helpful in preventing liver damage by carbon tetracholoride intoxication. Studies thus confirm the traditional hepatoprotective potential of burans flower. Investigations have attributed antioxidant properties of quercetin related flavonoids, saponins and phenolic compounds in flower and leaves. Burans flower juice can also be enjoyed to relieve hangover. Key phtochemicals have been isolated from burans flower which independently have established their ability in preventing cancer. Quercetin and Rutin present in burans flower inhibits growth of cancer cells and reduces risk of cancer. Together with other phytochemcials they offer antioxidant properties which prevents damage of body cells leading to mutation and development of cancer. Burans flower juice is considered prevent aging and bring back skin glow. It is strong antioxidant and offers benefits in preventing damage of skin cells by oxidizing action of sunlight and pollution. It offers anti-inflammatory and anti-bacterial properties to skin to treat acne, eczema, rashes and other skin inflammation. Burans leaves are astringent and poultice; it offers ability to heal wounds. Drinking burans flower juice is good way to enjoy its benefits to your skin. Applying burans juice to your skin can help reduce wrinkles, itching and other skin inflammation. One can try this homemade face pack using burans flower – Make powder of shade dried burans flower. Mix this powder with honey and apply to your face. Leave it for 30 minutes before you wash it with cold water. It will offer glowing, clean skin free of wrinkles. Burans flower juice helps in increasing endurance and can be used as sports drink to enhance performance. Traditionally burans flower has been used in Ayurvedic medicines used in treating menstrual disorders. Consumption of this phytochemical rich flower or its juice should be avoided in large quantities. It may interfere with action of some medications for heart and diabetes. Refreshing burans flower juice is worth trying while your visit to Himalayas. Though its availability is very local in nature, today Burans flower juice is available online. Just order one and enjoy a distinct taste and wide range of health benefits. For bulk order of burans flower juice order our affiliate. Antidiarrheal potential of standardized extract of Rhododendron arboreum Smith flowers in experimental animals. Yes, Buran Juice is a miracle juice. We sell Buran Juice. You can place your order @ 7017952770, Rajesh from Dehradun. Hey. How much quantity you would like to receive? you may contact me at ankz.negi@gmail.com for orders. Well this is laxman Singh from chamoli uttrakhand most beautiful part of Himalaya along with lots of flora and fauna. For rhoda juice please let me know.